Sheri Hendrix understands the importance of being a self-advocate. At the age of 41 she went to her doctor and asked if she should be having a mammogram and explained that her grandma and great grandma both had breast cancer. Her doctor said that it wasn’t hereditary because her mother didn’t have it. But Sheri insisted on getting her mammogram. After her first screening, she was diagnosed with Stage III or late stage breast cancer. She is currently in treatment and although she is a single mother of three daughters and battling for her life—she has the most positive, brilliant attitude that inspires everyone around her. Sheri is a San Diego native and resides in Normal Heights. She works for GEICO and is currently on leave until she finishes her treatment. With the surmounting bills from this expensive illness— Sheri was referred to Susan G. Komen San Diego’s Community Resource Advocate who works in the African American community to reduce breast health disparities and increase access to care in San Diego. Despite having lower breast cancer incidence rates, African American women’s mortality rates are 41 percent higher than their counterparts. Komen San Diego was able to provide Sheri financial support to help her during this daunting time and ensure that she is able to continue getting her treatment. Sheri wants others to know the importance of advocating for yourself and your health. 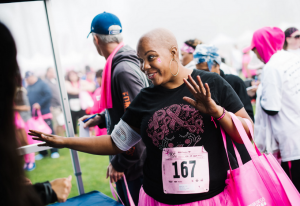 Komen San Diego helps breast cancer patients stabilize their lives during crises and provides limited, temporary financial assistance for the most critical needs such as living expenses, groceries, co-pays and more. These services are provided by a Komen grant to Jewish Family Service of San Diego. For more information please call (858) 637-3210 or email breastcancersupport@jfssd.org.